Cornerstone Appraisal & Restoration Services delivers value to both homeowners and insurance companies with expert, quality-driven, cost-effective restoration services. Cornerstone Appraisal & Restoration Services opened in 1993 and is certififed in New Jersey and Pennsylvania. Our team has over 80 years combined experience in construction and restoration. 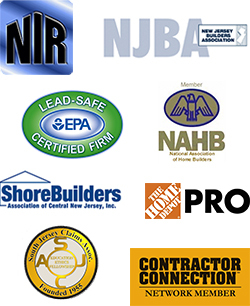 We service locations in Central and Southern New Jersey as well as Eastern Pennsylvania. Cornerstone is recognized for our quality work and we are listed as “preferred contractors” for many major Insurance Companies. We are considered an innovative and leading company in the areas of property damage, reconstruction and remodeling. We have built our heritage one project at a time, with a reputation for performance, integrity, honesty, and responsibility. Consider the outstanding testimonials from our customers, and our gallery of work. Please view our credentials and independent survey results by clicking here. Cornerstone Appraisal & Restoration offers a team of senior appraisal and construction professionals who bring a broad range of skills to your reconstruction project. They are your partners with real-world understanding of how any large loss impacts value. We leverage every resource to minimize the disruption to homeowner. Our team functions as strategic loss managers, offering the confidence that every aspect of losses will be planned, organized, and executed with the most professional attention to detail, following today’s recommended and required procedures. Even though Cornerstone Appraisal & Restoration Services is located in Princeton, New Jersey, you may be surprised to learn that we serve the entirety of Central and Southern New Jersey and Eastern Pennsylvania. This includes Atlantic, Burlington, Camden, Cape May, Cumberland, and Gloucester Counties in Southern New Jersey. See our entire location list, including towns and zip codes, below. For more information and to download the full zip code list, click the button below.